A cappella supergroup Pentatonix are ready to fill 2018 with new content. Today (February 27), they announced the imminent release of an album’s worth of material and shared plans for a summer tour across the United States. Called PTX Presents: Top Pop, Vol. I, the album will drop on April 13. Based on the steamy cover of Camila Cabello’s “Havana” they rolled out last week and the title, it seems like the LP will see them reinterpret other popular anthems. 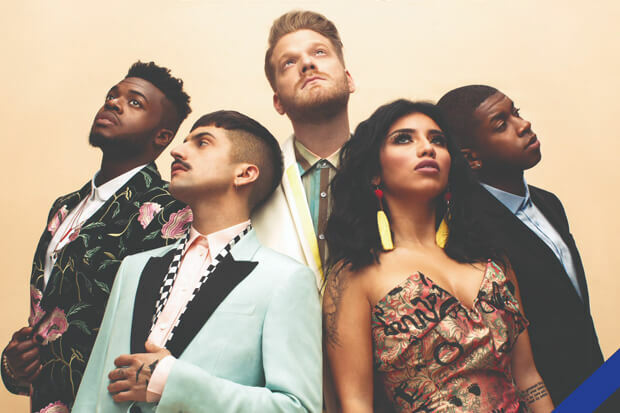 It will be their first full album released since their original bass Avi Kaplan was replaced by Matt Sallee. With any luck, they will also include some new original material as well as more reimagined bops. Later this summer, they will hit the road for a series of performances. The tour kicks off with a set in Salt Lake City, Utah on July 12. From there, they have a series of stops planned and will hit outdoor venues across the country. They wrap things up with a final performance at Hollywood Casino Amphitheatre in Tinley Park, Illinois. Along the way, they are sure to bring songs from their expansive discography to life with a series of ambitious arrangements and fun staging. Tickets go on sale on March 9, and more information can be found on the group’s website. Check out the announcement and tour dates below! Are you looking forward to seeing the group on tour? Let us know below, or by hitting us up on Facebook and Twitter!